Iconic Vietnam (stylized as #iconicVietnam) is a non-profit project creating flat icons and badges of the most iconic, picturesque touristic location in Vietnam to share the new vision about Viet travel. Occasionally, people do think about Vietnam as a poor country with several vestiges of destruction after war, nonetheless, nowadays Vietnam is a beautiful destination of adventurous traveling with various interfering tradition cultures. A tour around Vietnam is necessary for wanderlust who want to enjoy and adventure a 4000-years-old Far East civilisation. Iconic Vietnam is directed by Manh Nguyen, an artist from Hanoi (Vietnam) who works hard on both modern cultural designing and ancient historical designing. With support from Viet designers' society, the projects is created without gaining any profit, but the icons and badges of the projects can be easily downloaded below and used personally - for commercial use, please don't hesitate to contact him at his e-mail manh1810hp96@gmail.com for informing about the purpose of using. Thank you very much for the interest and now let's take on a ride. You can download this pack below after pressing "Like" button as encouragement for me. 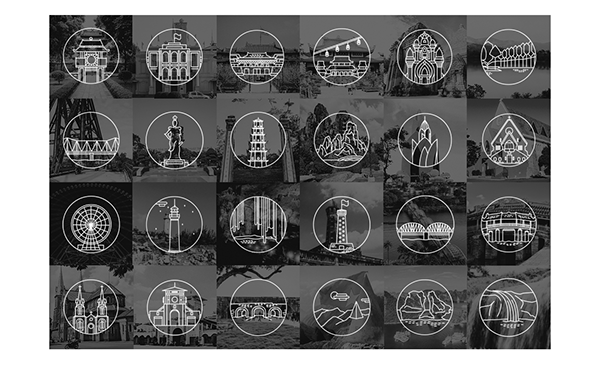 Iconic Vietnam (stylized as #iconicVietnam) is a non-profit project creating flat icons and badges of the most famous, touristic and iconic location in Vietnam to share the new vision about Viet travel. Occasionally, people do think about Vietnam as a poor country with vestiges of destruction after war, nonetheless, nowadays Vietnam is a beautiful destination of adventurous traveling with various interfering tradition cultures. A tour around Vietnam is necessary for wanderlust who want to enjoy and adventure a 4000-years-old Far East civilisation. Art Director: Manh Nguyen Designing Agency: ZinArtwork Duration: 15 days Keywords: Vietnam, travel, icon, badge, non-profit. Disclaimer: Photos used in this project doesn't belong to me. If this hesitate you or somebody you know, just let me know.